The Dynatek 2000SE Ignition is the latest from Dynatek. It is a piggyback unit that allows you to control the ignition timing of your motorcycle’s engine. The 2000SE uses direct coil driver technology and allows a high degree of timing adjustment. This ignition module can be used on any listed application with or without Power Commanders, Bazzaz Z-Fi or any other fuel controller. Input 1 and input 2 are used for switches. The switches must be configured in the Dynatek 2000SE software. Map: The Dynatek 2000SE has the ability to hold two different base maps. You can switch on the fly between these two base maps when you connect a switch to input 1 or 2. You can use any open/close type switch. The polarity of the wires is not important. Launch: A switch may be connected to input 1 or 2 to activate launch control. A clutch lever switch may be used by connecting the + side of the clutch switch to input 1+ or input 2+. When launch control is activated, the Dyna 2000SE will limit RPM to the target set in the software. Speed Limiter: A switch may be connected to input 1 or 2 to activate a speed limiter. You can use any open/close type switch. The polarity of the wires is not important. 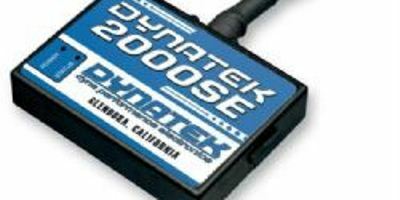 The speed limiter must be configured in the Dynatek 2000SE software. Speed: If your application has a speed sensor then you can tap into the signal side of the sensor and run a wire into this input. This will allow you to calculate gear position in the Dyna 2000SE software. Once gear position is setup you can alter your map based on gear position and setup gear dependent kill times when using a quickshifter. Analog: This input is for a 0-5v signal such as gear position, boost, etc. Once this input is established you can alter your ignition curve based on this input in the Dyna 2000SE software. Check out the clearance section of our website for some great deals including a 2006 Kawasaki ZX14 Turbo Streetbike with 400 hp! Schnitz Motorsports, Inc. is so confident we have the lowest price that we now guarantee it! If you find a lower advertised price from any authorized U.S. dealer on an in stock product, call or email us and we’ll match any verifiable price. Why settle for freebie offers when you can save real money on every item and your entire order with Schnitz Motorsports, Inc?